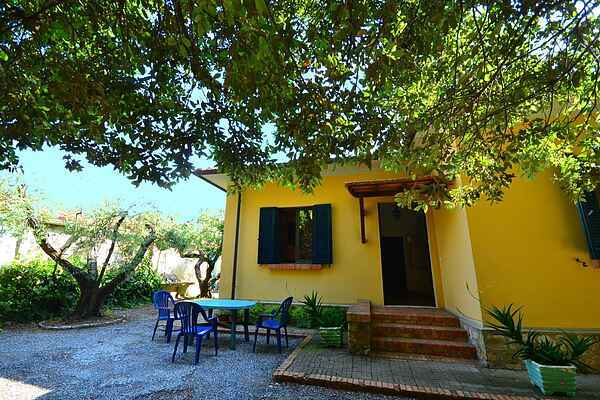 Ortolano is a detached cottage with private access to a rocky beach just 200 m from the house, accessible via 25 steps. It is located in a private park spread over 44 ha with typical Tuscan vegetation with olive trees and a breathtaking pine forest. It's furnished in a simple but comfortable way and located near the owner's villa. You have a garden with garden furniture at your disposal, which offers shade and refreshment because of its location in the forest. You can of course enjoy the beach, but there are also nice cities in the area to visit. In Livorno, you could visit the La Venezia neighbourhood, which looks a little like Venice, with enchanting canals, bridges and squares. Drive a little further and you'll reach Pisa. Besides its inclined tower, Pisa has many more things to offer. The art towns of Volterra and Pontedera are also worth a visit. Particulars: The house is not far from a railroad. This can cause some noise when the local train passes a few times a day.